Brian Rice created a new series of simple fun for the youngest with his Electric Crayon Deluxe games. These titles are picture books with uncolored pictures, inviting the kids to use the color map and filling in the blanks to create some toddler works of art. From 1985 to 1992, 11 of these titles were developed, ranging from Sesame Street, Super Mario and Inspector Gadget. 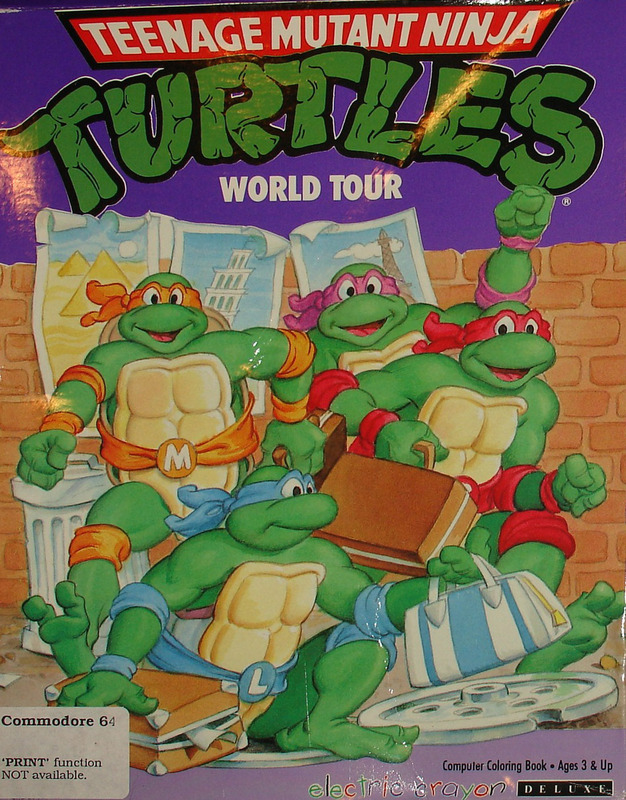 In 1990, no property was hotter than the TMNT, and so they got their own Electric Crayon book. Teenage Mutant Ninja Turtles: World Tour isn't much of a game, nor does it claim to be. 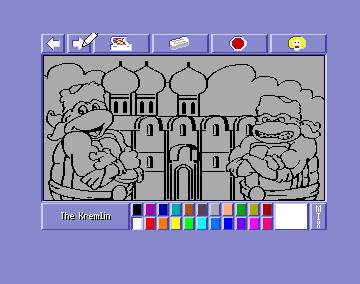 All you'll find within this digital book is outlines and 22 colors (which can be mixed) as well as an educational description of each of the landmarks that the TMNT are visiting. After coloring at your hearts desire, there is an option to print out the work to be hung up on the wall. 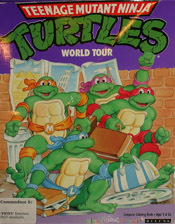 In all, there are 30 different locations that the turtles visit, their home, Statue of Liberty, Stonehenge, Eiffel Tower, Bavarian Castle, The Alps, The Kremlin, Leaning Tower of Pisa, Acropolis, Sahara Desert, The Nile, The Sphinx, Taj Mahal, Mount Everest, Great Wall of China, Mount Fuji, Australian Outback, Galapagos Island, Amazon River, Panama Canal, Teotihuacan, Golden Gate Bridge, California Redwoods, Yukon Territory, Mount Rushmore, Mississippi River, Kennedy Space Center, Lincoln Memorial and the White House. Wait, is that Lincoln or a Zentraedi? 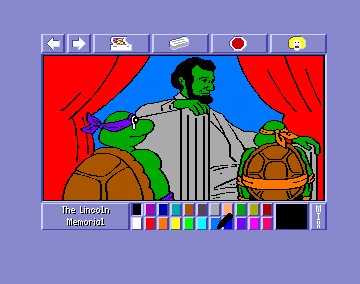 Anyway, considering the mass appeal of TMNT at the time, and the fact their faces and imagery was on virtually anything that could be bought with money, it' not an all out bad product, and kids do genuinely love to play around with colors. In addition to DOS and Amiga, World Tour also saw release on Commodore 64, Amstrad CPC and Atari ST. There's no real difference between any of these other than the C64 and the CPC having less colors and no print function. Even though the DOS version is not seen as rare, and can be widely purchased online still to this day, it has strangely never been publicly released on the internet. 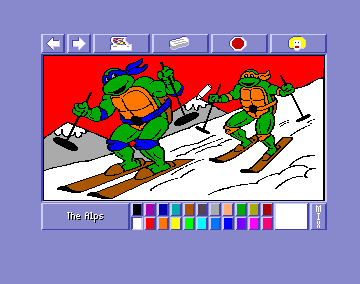 Until 1991, PC owners had been stuck with either mediocre ports of pre existing titles or educational kids' games to get their turtle fix taken care of. It seemed as if fans of Konami's games could never get a break on the home computers, as their Simpsons port was also lacking polish, and having a reputation of just being lazy attempts at cashing in on the license's popularity. Finally after so long, the home computer crowd would get a game to call their very own, built ground up for the computer. 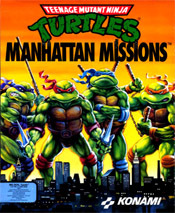 Teenage Mutant Ninja Turtles: Manhattan Missions never saw release on any other platform, making it the most obscure out of the TMNT series of games. Manhattan Missions was done by Distinctive Software, most famous for their Test Drive series, who had earlier handled other Konami properties such as Castlevania onto home computers. 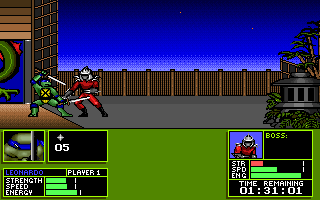 Sometimes confused as a sequel to the prior TMNT games or even a port of the NES game, The Manhattan Project (released 6 months later than Manhattan Missions), the game is actually a retelling of the origin of the TMNT and their battle against the ever emerging Foot Clan. In many ways opting for a similar approach as the very first live action movie did before it a year before, the general style and tone of the game is considerably darker and more in line with the original comics than the 1987 television cartoon. 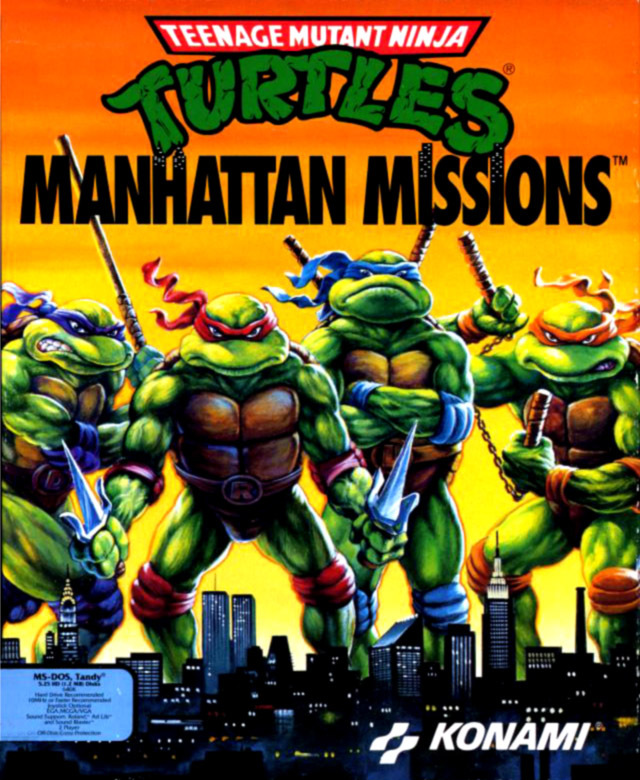 Manhattan Missions does use elements from all the iterations of TMNT that was available by the time of its release however. 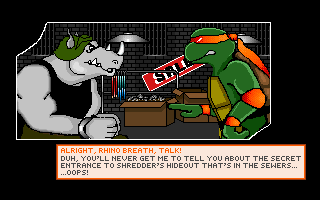 The origins of the turtles sticks fairly close to the original comics and are told at the start of the game in the way of comic book styled cutscenes with animated panels. After having saved April from a gang of Foot Soldiers on their first night out on the surface, Master Splinter teaches his sons about how they came to become mutated ninja turtles due to a leak from a canister holding radioactive ooze, granting them intelligence and anthropomorphic features. Hiding from society in the NYC sewers, he trains his sons to become Ninja, to one day defeat The Shredder, head of the Foot, as he has started to build his evil empire in the Big Apple. The pacing and wording of this story is near identical of that found in the live action movie, though Splinter's connection to his former master Hamato Yoshi is emphasized at all, and so the Turtles's cause is more straight forward heroic than personal. Once the exposition is finally laid out, the game starts its main story, which are essentially five different stories interwoven into a larger plot, pitting the four brothers against foes of all shapes and sizes. In one part of the city, Triceratons have come from their planet in for unknown reasons, leading the Turtles into discovering the intentions behind their visit. On another side of town, arms dealers are smuggling weapons into the Brooklyn area, while downtown there is an arsonist on the loose in the Environments segments. Ivory smugglers are illegally dealing with elephant tusks for unknown reasons on lower west side, and Extortion is threatening the city on the upper West Side. Each of these different sections can be done at random, and consist of four segments each that tell the progression of the story before and after the stage is completed. Shredder has placed the city under a 48 hour time limit before he takes over, and the 48 hours tick down in real time. Much like the first NES game, the focus of this game is set on the teamwork of the four brothers, and each of them come with individual move sets based around their respective weapons. 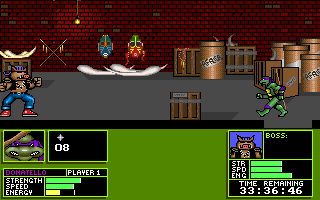 Furthermore, their skills increase as the game goes on and they are being used, shown in the form of a skill bar on the bottom of the screen. This increases based on how much they are used in game, and the more they are used, the more attacks they are able to perform to form longer strings of combos. 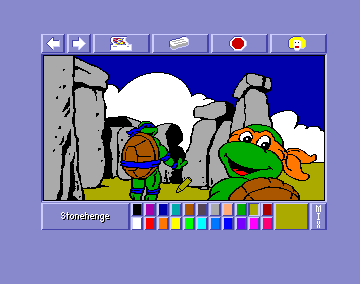 Before each stage, an option menu will appear as the turtles are located in their sewer home, where the player has several choices of action. 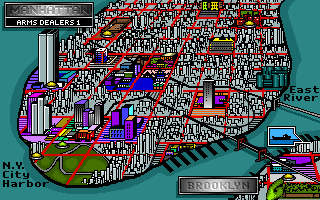 The City Map option leads to a map of NYC where one chooses the stage to play, while Training allows for the turtles to combat a holographic enemy of choice in order to increase their skill meter. 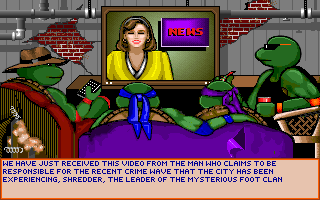 Apart from a Save option, there is also a Status screen that brings up an overview of all four turtles and their current status and a Rest option. The key to the game is to balance the use of turtles and manage their health appropriately in between one another to avoid them being knocked out. Turtles can be changed on the fly, and health refills can be found on the stages in the form of pizza. The most common way of regaining health however, is to pick the Rest option in the sewer hideout where the turtles will rest over the chosen amount of hours. Even though their health is refilled, this cuts into the time limit severely depending on how much rest is needed, and so one most take into the account how much time is left, and how badly rest is needed. Once the clock turns 0, the game is over. 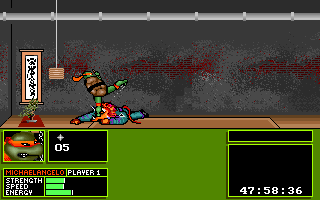 The turtles themselves never fully perish over the course of the game, rather they are simply knocked out much like in the NES game, though unlike that particular game the turtles are rescued by vigilante Casey Jones upon defeat, marking his first appearance in a TMNT game. 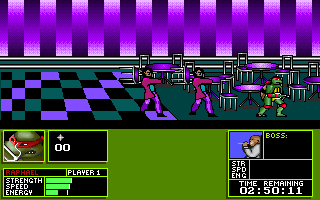 The game allows for simultaneous two player game play. 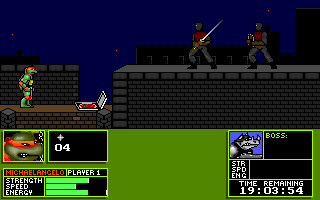 Controls and combat is done in a rather finicky way, one that takes some practice to get used to. Played entirely with the keyboard, the arrow keys will move the turtles around as commanded, when Enter key, the arrow keys turn into attacks (think International Karate). Each direction towards the enemy will trigger different attacks designated either upwards, thrusting forwarded or downwards depending, and the more presses are done, the more attacks is performed. When holding Space, the turtles go into a defense mode which works in the same way as the attack mode though defensively instead. While in these states of combat, the brothers will not move and they will be virtually defenseless while moving, so it is essential to get used to the different modes in order for them to properly navigate and combat. Most of the game is not linear, and allows for a mostly free set path of progress, though certain items need to be acquired before some sections can be fully ventured. Each stage will feature an end boss, sometimes preluded by a cutscene. 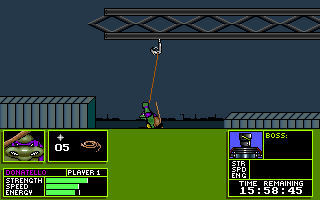 Some sections also makes use of additional items, like the grappling hook. The graphics, apart from the colored headbands, are for the most part either inspired or lifted out of the original Mirage comics, most notably the style by Michael Dooney, with a much darker and serious overall tone. The story also makes use of a lot more fantastique elements than found in the cartoon or live action presentations of TMNT, and introduces the characters like Triceratons in a much more central role than ever found in the cartoon. Enemies also retain their designs from the original comic book, and are more indistinct low class thugs and mobsters than they are directly Foot clan members. Other alien species also appear as enemies, like anthropomorphic cats and mutant mobster rats. April is kept more in line with her cartoon persona as a TV presenter for Channel 6 news, and her design is based on actress Paige Turco. Some characters from the cartoon show also appear, such as Rocksteady, Bepop and the "Doc Brown" version of Baxter Stockman, rather than his African American original design from the comics. Tatsu, Shredder's henchmen from the live action movie, also appears for the first time as a boss. There is no real music to be found in the game, rather the game opts for a more eerie night mood with higher quality sound effects for its time. At the time in 1991, home computers were not yet a fully realized gaming platform, and far from as widespread of a household item as it is today, so the audience was presumed to be an older and more technically savvy than that found on the home console systems. This lead to Manhattan Missions being a bit deeper and darker than the other games before it, and definitely the most interesting purely design wise. The tone of the game both graphically and atmospherically is pretty stellar for a 1991 game, with lush graphics and cool night time scenery, and the turtles have a much more sinister and lethal feel to them, making use of their weapons more efficiently and maybe most important, diversely. The non linear storyline and stage setup is also a very welcome change of pace, but most of the game's unique features feel a bit underutilized. The timing of the combat system is a little bit uneven due to varying speeds between enemy animations and the turtles themselves, and mastering the defense system is a chore due to this. The combat also suffers from some of the same issues, and while in certain boss battles strategy and well placed attacks help, for the most part it just turns into button mashing hoping for the best. Most glaring however is the whole time aspect, which is not stressed strongly enough in the story, and also does not feel very intimidating in game, only becoming a bother during rest then quickly forgotten. Worse yet is the fact that for a game that gives the player 48 hours, it can still be beaten in about 30 minutes, even during the very first playthrough if one just decides to avoid combat altogether and head for the boss. Due to the short length, the idea of powering up each individual turtle becomes sort of obsolete. 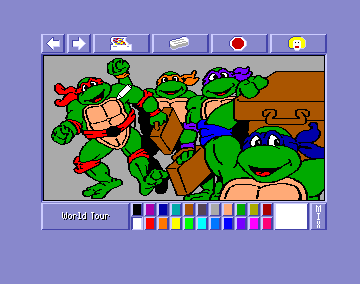 It's certainly the most interesting of all the '90s era TMNT games, with its unique mix of inspirations and design choices, and true diversity between the turtles. It just sadly feels a bit underwhelming once the halfway point is reached, and many of the aspects that draw you in initially, are suddenly made redundant or just not properly focused on. The locations, graphics and story does make up for a lot of its shortcomings however, and TMNT fans should find enough enjoyment to keep them going, though for a general player it feels more like a playful experiment rather than a complete experience. The end sequence, ascending upwards in a pagoda fighting a boss on each floor, is a rather nice touch and nice homage to Bruce Lee's Game of Death.